Happy PPF Lisa is one of my favorite artists. She is inspiring and it is nice to see her featured. Can't wait to see what all of your have created this week. Congratulations, Lisa! I always like your work. Thanks for hosting, Eva and Kristin! Happy PPF everyone, and congratulations Lisa!!!! Hi Lisa...he sure is a "dandy rooster"...really handsome! Lisa, this painting is so cool and makes me miss my chickens. 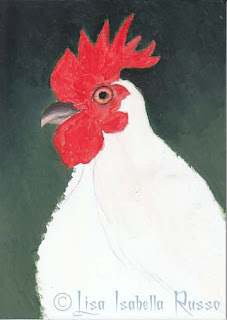 nice rooster painting by Lisa. Happy PPF! Finally, I managed to sit and draw! Thanks, all, for your inspiration! Lisa!! Your rooster is fantastic! And what perfect timing. Happy Paint Party Friday everyone. I always love and enjoy Lisa's work...gorgeous art..the rooster is beautiful! Happy Paint Party Friday! That rooster is fabulous. Thanks so much for featuring my little rooster friend, I am still working on him, I have an update on him today and hope to post the finished version on Tuesday... Happy PPF! What a wonderful, and very proud rooster! Have a great Chinese new year, Lisa! Congrats on being featured.